3 Different Investor types - Which is Best? Home » Investment » 3 Different Investor types – Which is Best? 3 Different Investor types – Which is Best? 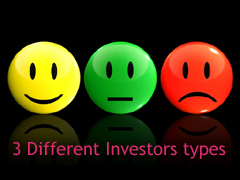 How different type of people does investment and what are investor types? Why only few investors make more money than other? What it takes to be a true investor? Well after long debate we could make out three different investor types. Type -3 Investors are not financially educated or sound in terms of finance. They often seek advice from friend, relatives for investment. These investors are from usually job oriented mindset and they make investment from retirement & money saving prospective. They don’t know much about investment & finance and they have to rely on the advice of so-called experts. What do you think Type-3 Investor can become financially free ever? Where do you think I should invest my money in? Do you advice to buy real estate? I have few share of XYZ company should I sell them? Which stock I should buy for 5 year prospective? Everyone advice to diversify portfolio what do you think? Type-2 Investor take advice from professional experts or domain expert before making investment.Type-2 investor should interview several tax advisor, financial planners, stock brokers and real estate experts before deciding anything. Type -2 investors must see that investment advice is genuine and not given only to earn commission. High income employees and self-employees fall in this category because they have less time to look for good investment opportunity. Type -1 investor’s opportunist they are always looking for good investment opportunity. Types -1 Investor are smart and they know every aspect of investment and asset class. Examples of type -1 investors are ‘Rakesh Jhunjhunwala’ or ‘Warren Buffet’. Type -1 investor are very good at number. They do lot of research before making investment. Type -1 Investor are very successful in terms of investments. In order to know what type of investor you are you have to ask simple question. Do I have full knowledge about asset class where I am investing money? My investment decisions are based on what? If you do not carry enough knowledge about finance and often take advice from friends and relatives you are in Type-3 investor. While doing investment if you take advice from financial planners, stock broker or any professional experts than you can consider yourself as Type-2 Investor. If you are independent in terms of doing investment after gathering advice from expert & after carrying proper analysis and study you are Type -1 Investor. Of course you need lot of financial education and network of financial expert in order to become Type-1 and Type-2 Investor. You should start working in that direction become financially independent. If you like this post, do share it with your friends on Facebook and Twitter!